Guest post from Kilimanjaro climber Shyroll Morris. Summiting Kilimanjaro on New Year’s Eve was magical! It was truly special to be at the top of the world before ringing in 2018! Our Tusker guides Eliakimu, Pastori, and Urio were incredible! We were all amazed by the depth of their training and customer service skills. We felt safe, and they seemed truly vested in ensuring that we had a wonderful experience. They were aware of every detail that would impact the client experience and ensure our safety. They adjusted to each client while also maintaining positive group and team dynamics. Eliakimu in particular had an amazing leadership style that ensured a positive experience for everyone. It seemed that all of the guides and porters looked up to him as a top expert on the mountain. 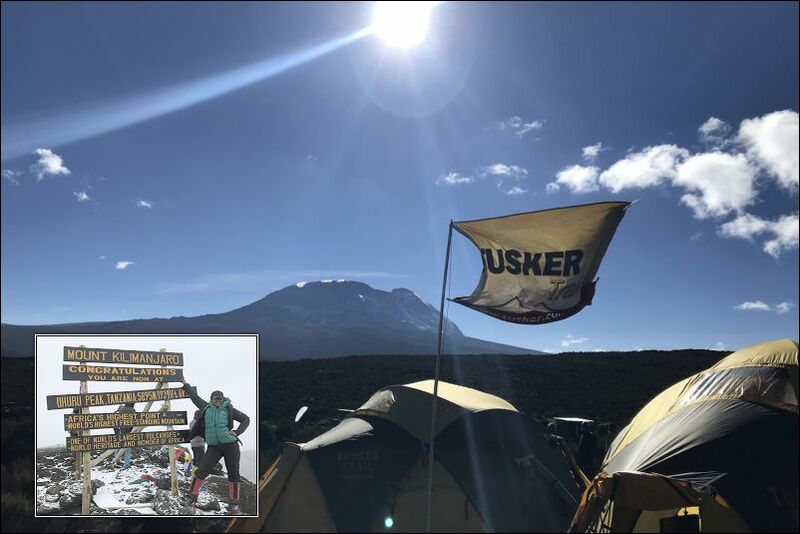 It was obvious that our Kilimanjaro guides were very proud to work for Tusker, and we felt confident that Tusker was the best company to bring us up the mountain. It was further validated by the many guides from other companies who came to our guides for advice. There was a point that we saw a climber from another group crawling on hands and knees, and our guides stopped to help support them. It was their advice that probably saved that young lady’s life. The entire Tusker crew was amazing and reflected the Tusker core values. Chef Tosha’s food was so good that I actually gained a few pounds! Our waiter Hassani took care of us is such a kind way. Charlie our Camp Master had wonderful organization skills and attention to details. He also supported me on the summit and was just amazing. Daniel always took care of our water with a smile each and every time. There were many more crew members that stood out, but I didn’t get all the names. As I look back on this trip, I am so thankful for the team. They provided a truly incredible experience! I learned so much about Kilimanjaro, the mountain ranges, Tanzania and its people. It was amazing, and I firmly believe that Tusker was the best company to climb with.